Just because the yellow school buses are making their rounds, it doesn’t mean summer is over. So let’s put down the pumpkin-spice-everything and savor these last days, deal? Toll House Hotel in Los Gatos, CA doesn’t skimp on summer. (In fact, they don’t skimp on much of anything.) 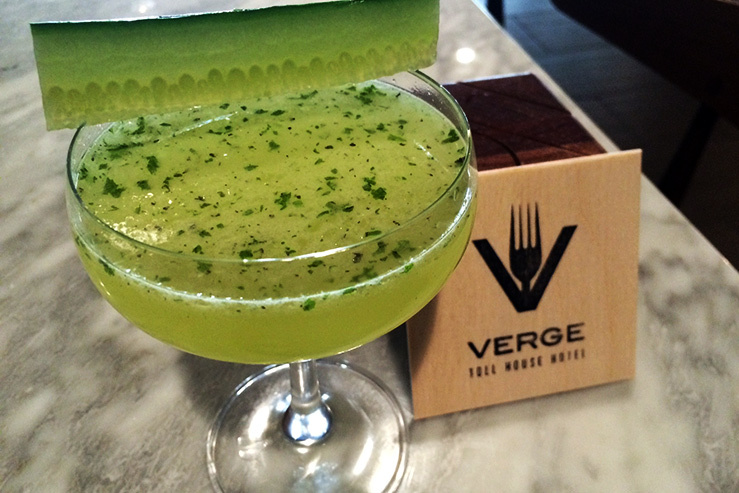 The on-site restaurant, The Verge, is a fast favorite among locals and travelers alike. A recent $1 million floor-to-ceiling renovation, tripled the capacity and added thoughtfully designed seating for both large parties and solo-travelers. In the spirit of their over-the-top hospitality, they’ve opened their bar to share the recipe for one of their top-selling concoctions — the Cucumber Mint Cocktail. Now, you can bring Toll House to your house, just in time for the for the final days of summer! 2 Cucumber slices + more for garnish. Add ice, tequila, yellow chartruese, lime juice.